Staying ahead of the latest innovations keeps Australian mining strong, and in the uncertain economic times facing the industry in 2015 and beyond, any advantage that technology can deliver should have our full attention, writes Thorsten Punke. Power-over-Ethernet, and more recently Powered Fibre, can address many issues surrounding the installation and power management of low-powered devices in a mining organisation. One of the big challenges for a new site is deploying small cells, HD CCTV cameras, digital signage, Wi-Fi hotspots, and other remote devices. Often, the hardest part is finding a local source of power for these, especially at remote sites. Power-over- Ethernet (PoE) has gone a long way towards solving many of these problems, as it provides an effective means of reducing cabling infrastructure and lowering overheads for essential, low-powered devices. Recent developments in PoE technology have taken these benefits further, using power and fibre-optics together in a single solution to offer a higher power load and faster data speeds at a far greater distance than traditional PoE models. Typically, a large-scale deployment of security cameras or communications devices would involve a data cable for transmitting digital images (or analogue cable for closed-circuit TV cameras) as well as separate copper cabling for the power supply. Since cameras and wireless access points tend to sit on a ceiling or in a high position to generate the best view or reception, it usually involves running a substantial amount of cable to each individual device, often in difficult-to-access positions. In contrast, PoE allows the devices to run on just one cat.5 Ethernet cable, supplying both power and data to the networked devices. This means that a separate power supply next to each device is no longer needed, effectively halving the amount of cable that an installation will require. The result will be a quicker, easier installation with less digging, drilling and fewer physical ‘cable pulls’ by the installation team. Smaller conduits can link the devices, again requiring less manual work to install as well as saving on hardware costs. Ethernet cables are relatively cheap also, and offer a fast data rate as well as peer-to-peer networking (P2P) among devices. In short, a PoE network can be installed more quickly and cheaply than traditional copper networks. The end product tends to be more robust too, another major consideration for Australian mines. Fewer cables in the ground means there is less chance of something going wrong, such as an accidental dig in the wrong spot, damage from a blast, subsidence causing faults in a sub-station and so forth. There are a variety of Ethernet cables, some of which are more suitable to a mine environment than others. For example, the casing that insulates Ethernet cables is generally made of polyethylene or PVC, both of which are halogen-based. In case of a fire, halogen can release toxic gas, which can increase the hazards inherent in a dangerous situation. Low Smoke Zero Halogen cables (LSZH) are a good choice, as they reduce these hazards, producing no poisonous gases when exposed to flames. LSZH wires also tend to be lighter by construction, which aids installation and makes transport easier and cheaper. Ethernet cables are also available in UV-resistant forms, which can lengthen the life of those cables exposed to UV radiation from the sun. Some cables are manufactured with fewer environmentally harmful chemicals than others, which is another consideration in a highly regulated industry. When a design is drawn up for a new site, network engineers generally have a plan for where they want to place devices, but the absence of a local power source sometimes forces placement in alternative locations, or it means hiring an electrician to bring power to the remote device’s location. Putting the devices in areas that are convenient is not always the best solution – while it may reduce man-hours and costs in the short term, many devices will not work as effectively. A WiFi hotspot should generally be deployed in a high area, for example, so that the signal can be sent outwards and down, maximising the range of each device. But since running a power supply up into a high area is not always convenient and tends to cost more, compromises are often made. The device will not run as effectively, reducing employees’ productivity and potentially requiring more hardware to achieve the same end result. Power and data cables also need to be installed carefully to avoid creating ‘cross-talk’, or radio interference on the data line. This generally means keeping them apart from one another, so the chance of data interference and corruption is kept to a minimum. PoE goes a long way towards solving these sort of issues, since it negates the need for a separate power supply running to each device in the network. Since the one cable will carry power and data to each device, it opens up scope to deploy machines where they will be most effective. Since many PoE-enabled devices are scalable, they can save an organisation a great deal of money and at the same time, reduce its environmental footprint. Scalable devices can be turned up or down depending on power needs at certain times of the day, turned on and off remotely and monitored for optimal power and data flow. The ability to manage a network of devices centrally also saves a company time and money, increasing efficiency by allowing insights into how a network is running. PoE-enabled devices can be centrally managed, which means many functions can be controlled remotely through a single pane-of- glass. Of course, centrally managing a network of powered devices also allows an organisation to reduce its environmental footprint, since the devices can be optimised. Whereas a traditional network of CCTV cameras demands a constant supply of power, PoE devices can be turned up or down at certain times, and placed into standby mode if required. The easier deployment of a PoE system also reduces environmental impact, since there will be fewer actual network components. Less raw material, lighter transportation, reduced drilling and fewer conduits all make for a healthier environment. Simply obtaining access to local power can be a difficult and time-consuming process, depending on factors such as the remoteness of the site, local infrastructure and power demands. For any scale of operation, whether it is a large mine camp or a small exploration in a remote area, a great many devices are going to need power – from the lights through to air-conditioning units and IT infrastructure, right down to small, low-powered devices such as the IP cameras and WiFi hotspots as mentioned. The organisation must either negotiate access to local power with utility companies, or ship in a diesel generator which will require daily refuelling. In some cases the utility company may require a meter at certain points throughout the network, which means the cell needs to be at eye level. Even without the need for meters, the negotiations about access to power can take weeks or months, requiring the planning team to make phone calls, visit sites and negotiate with third parties. Once access to power is negotiated, the operator must deploy electricians to the sites to bring power to the network of devices. This takes time and adds to the cost Emergency phone of deployment. Accessing power for IP cameras, communications devices and WiFi hotspots is made a whole lot easier by using just the one cable, streamlining the installation at the same time as reducing costs. By delivering power with connectivity, the network operator reduces the demand for local power to each remote device, and therefore the complexity of acquiring power to the site. Moreover, the hybrid cable can eliminate the need for an electrician if the cable has plug-in connectors. Many PoE solutions are approved for installation by a cable technician, again saving the company money on contracting skilled electricians. PoE can handle relatively small power demands, but sufficient power to run a wide range of the essential devices found in Australian mines. The PoE 802.3at standard can provide up to 25.5 watts of power, at distances of up to 100 metres on cat.5 cable. To provide power for PoE, the Ethernet switch must have an additional power supply, typically delivering 1480 W solely for PoE ports. As discussed, one big advantage of PoE is that it supplies both power and connectivity to a device over the one cable, as long as the remote device is designed to accept power in that manner. IP phones and IP cameras, WiFi hotspots and other small devices are often set up for PoE these days, so there is a wide range of options available when sourcing hardware. One disadvantage of PoE, however, is that since it is an Ethernet cable standard it lacks the necessary capacity for high-bandwidth applications such as backhauling small mobile communications cells. Drawing power from the same cable as data can also reduce the speed at which data travels, further reducing the capacity of a network. In addition, given the relatively limited reach of PoE, it is often not suitable for deployment in remote areas of the mine site that are isolated from the rest of the ecosystem. Typically, the Ethernet switch that provides the power and connectivity is located in the same building or in a wiring closet near to the remote devices being powered, so any deployment is still going to need a switch box and some kind of larger infrastructure fairly close by. A range of 100 metres from the switch to each device is about the limit one can expect for a PoE device. While PoE has been an accepted standard of addressing many power and installation challenges for about 15 years, recent developments have introduced another method which promises to take the solution to another level. Powered Fibre Cable acts the same as PoE, transmitting both data and power to remote networked devices, but can achieve far greater speeds and distances, overcoming some of the traditional deployment problems of PoE networks. In a powered fibre system, each cable is capable of delivering 25W to a device at a distance of up to one kilometre, giving the system much longer reach than a PoE network. All the attendant benefits of PoE remain, such as easy installation, scalability and remote management, but the data capacity and range of the deployment increases exponentially. A Powered Fibre cable combines single or multi-mode fibre along with a copper power cable, so is essentially providing the best of both mediums. Power travels along the copper cable in a simple, cheap and robust form, while fibre permits the transmission of large amounts of data at very high speeds. A typical, complete Powered Fibre solution such as TE Connectivity’s PFCS includes a rack-mounted power and optical fibre termination point, the hybrid cable itself, and a remote termination node for each device that plugs into the cable. Since a system such as this uses plug-in electrical connectors, the installation will not require an electrician at the remote sites to install connections. The system incorporates DC/DC conversion technology to eliminate DC line powering calculations, and it features primary, secondary, and tertiary electrical protection for use in harsh outdoor environments as well as indoor venues. These make it a very strong medium for use in Australia’s typical mining conditions. An optional media converter allows the powered fibre cable system to be used for PoE if desired, so it opens up scope for expanding an existing deployment, or incorporating different elements within the same network of devices. However, this means having two sets of media converters, a copper interface as well as a fibre interface, which can become messy and may require highly skilled installers. An integrated Power/Fibre system with a universal interface is capable of supporting PoE, PoE+ and PoF components in the one network, which opens up scope for much larger networks than have been possible in the past, with all the advantages of a PoE deployment such as power saving, quick installation and central management. In addition it extends the total channel length from 100m up to 3000m. The universal interface is capable of converting the received voltage to the correct amount for a specific device. Since the correct voltage is measured by the interface, it removes the need for an electrician to set up new devices on the network, again saving the organisation time and money. A typical deployment for, say, one hundred low-powered PoE devices might look something like this: one modular Power Supply Unit (PSU) sending power to several interface panels, which in turn connect to hybrid cables running out to each PoE device. Depending on the power demands of the devices at each end point, each hybrid cable can extend up to one kilometre from the interface panel, giving the network a much larger, faster and more robust backbone than that of a legacy system. As discussed, the network will be scalable, to turn power up and down and offer better power management options, as well as turning off machines remotely and monitoring them for faults. Electrical safety is of critical importance in a mine environment, and the technology can have some excellent benefits in this area. Since Powered Fibre provides electrical isolation between the device and the power supply, it helps protect the power supply and devices from dangerous voltages such as lightning strikes, and can also reduce the risk of voltage from the supply igniting explosives. Fibre also offers very fast data speeds,resulting in clear benefits over legacy copper networks. As mentioned, PoE tends to reduce the speed that data flows over an Ethernet cable, so isolating the power and data components from one another in the same cable negates this issue. Having fibre-optic speeds running out to remote devices helps to future-proof a site, since the capacity of optical cable far exceeds the current data demands of an organisation. Powered Fibre solutions also meet modern standards for providing network architecture. For example, the Metro Ethernet Forum’s Carrier Ethernet 2.0 (CE 2.0) standard enables service providers to transport many different levels of Ethernet over a mine’s existing fibre infrastructure. 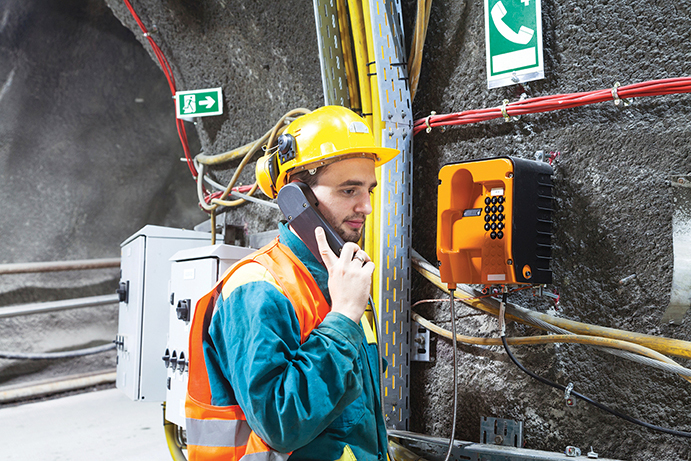 Focusing just on mobile communications for a minute, an integrated Powered Fibre solution can also extend the range and speeds of a mine’s 3G or 4G network, enhancing mobile connectivity and increasing productivity throughout the site. A network of small cells, or mobile access points, can be deployed over the same hybrid solution, again allowing a far greater range than by using PoE or PoE+. The ability to transport power further makes it possible to place small cells exactly where they are needed to enhance wireless capacity. Solutions exist in which remote powering units can be factory terminated on to the hybrid cable with exactly the right connectors for any given small cell. To place a small cell exactly where it is needed, the user simply plugs in the connector, mounts the remote powering unit, and installs the cable back to the power supply located up to 1km away. The system is basically designed to act as a long extension cord. Carrier Ethernet 2.0 enables key applications from cloud services to mobile backhaul, transported over all technologies using traditional or SDN approaches. On its face, CE 2.0 is a service delivery standard, and does not address the need for local power at the remote equipment site. For example, CE 2.0 has been used to backhaul traffic from small cells, but it does not generally provide power for those small cells. However, when transported over powered fibre cable, the CE 2.0 protocol stands to provide the best of both worlds: it delivers carrier services with class of service, interconnect and manageability, and also delivers power to remote locations. Fibre cables are immune from electromagnetic interference, which is partly negated in a Powered Fibre solution since the power is still coming from copper cabling.However, optical fibre cables also have a very high tolerance to electrical noise, so data can travel through areas of high electrical noise without compromising stability. The fact that optical fibres do not radiate electromagnetic energy also has security benefits, as it means that emissions cannot be intercepted. Tapping a fibre optic cable to steal sensitive data is much more difficult than tapping an ADSL network, so fibre is considered the most secure information medium. A Power-over-Ethernet system can bring a broad spectrum of benefits to Australian mining, from reduced ‘cable pulls’ at the time of installation, right through to reduced running costs, better network visibility and lower environmental impact. Powered fibre has the ability to take these benefits further by expanding the range of a network of devices, and future-proof an organisation by greatly expanding the speed and amount of data that travels throughout that network. Thorsten Punke is the Marketing Manager ANZ for Broadband Networks Solutions, a TE Connectivity Division. He is responsible for strategic, program and technical marketing with 16 years’ industry experience and a broad knowledge of copper, fibre, testing, power and active technology. Before he joined the ANZ team Thorsten was based in Europe as a global Program Manager for Office Networks and for Data Centres in the Europe, Middle East and Africa region. He is author of several articles, is familiar with international business protocols, and works closely with standardisation members. Thorsten holds a Masters Degree in Electrical Engineering. Great article.. I agree with the above poster. It’s all about a combination of different ingredients that create the perfect strategy. We agree and support this page details.